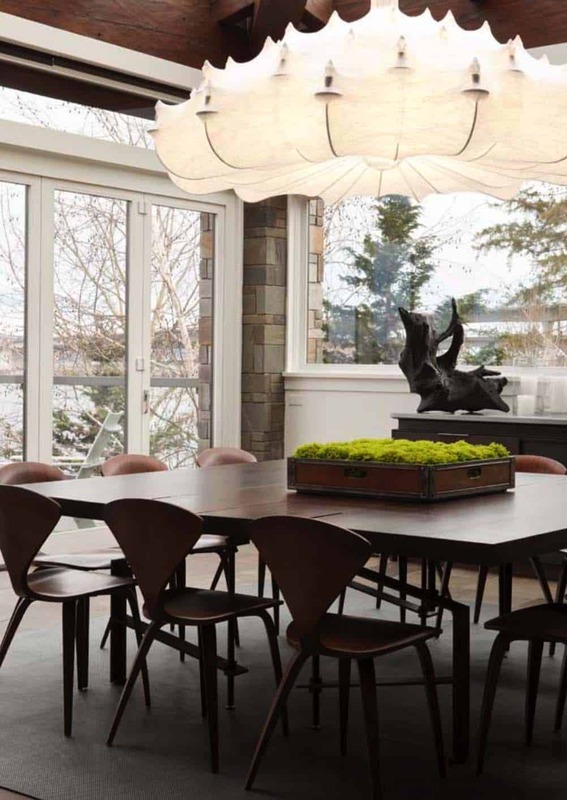 DeForest Architects transformed an existing lake house in Seattle, Washington from a home full of heavy stone and beams into a light-filled place for enjoying art, food and family. 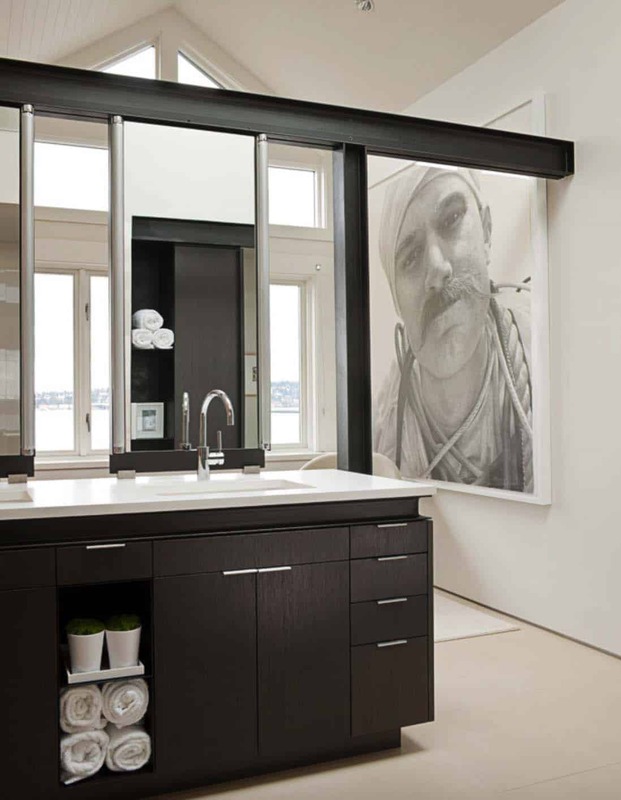 The homeowners are a creative couple — an entrepreneur and artist — who commissioned the architects to transform their home on Lake Washington into an elegant, family-friendly house filled with light and art. 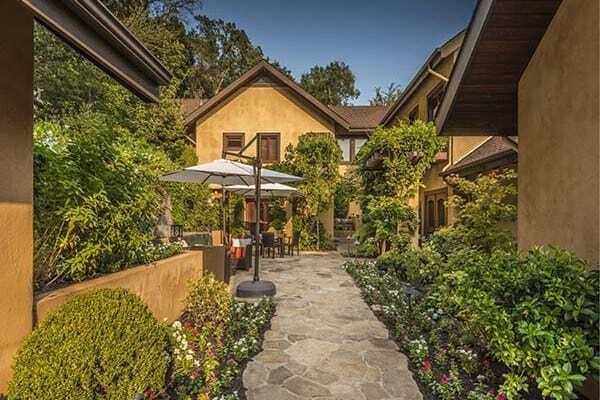 The original home was weighed down with lots of heavy “lodge-inspired” materials. 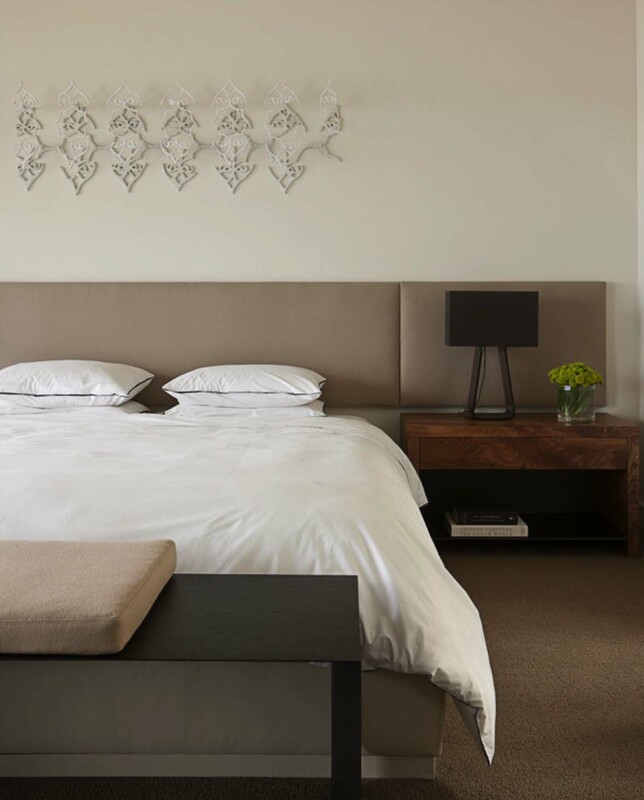 The design team shed the majority of the lodge aesthetic and brought the home to a more modern style. The flagstone wrapping the columns was existing to the dwelling. 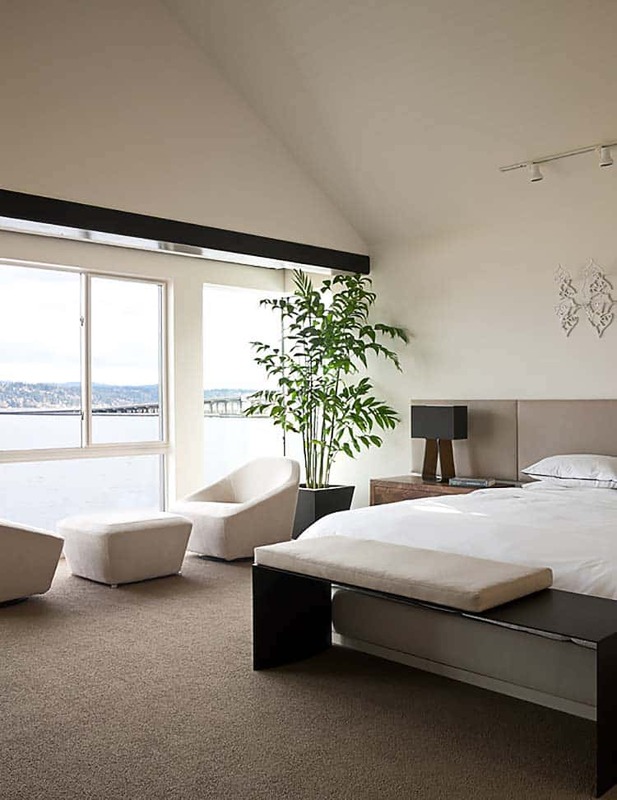 Above: The sofa is from Room and Board – Reese Sofa and Chaise. 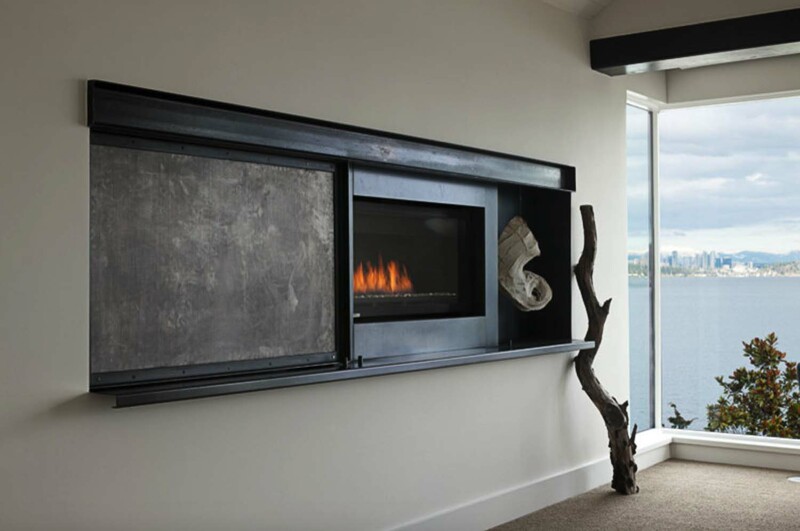 Above: The living room fireplace surround features a blackened steel plate and channel above. 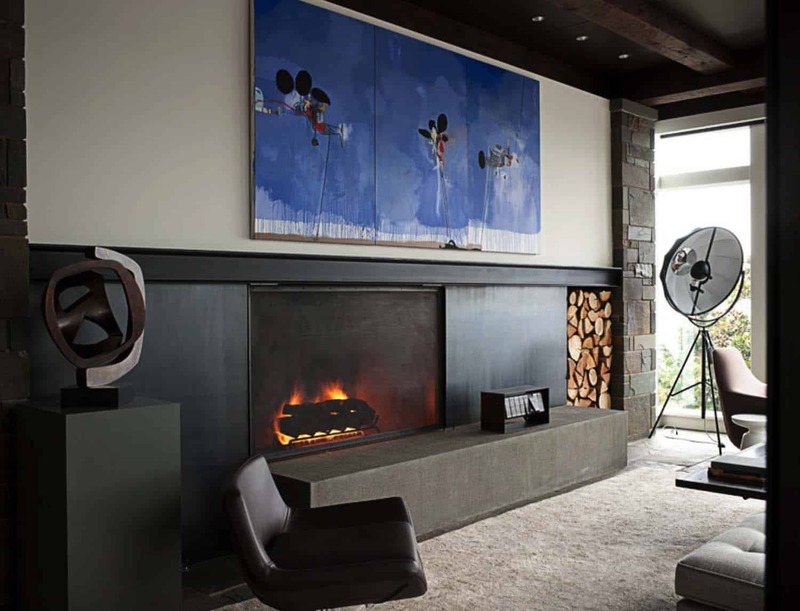 The light fixture next to the fireplace is the Fortuny Lamp – Design Within Reach. 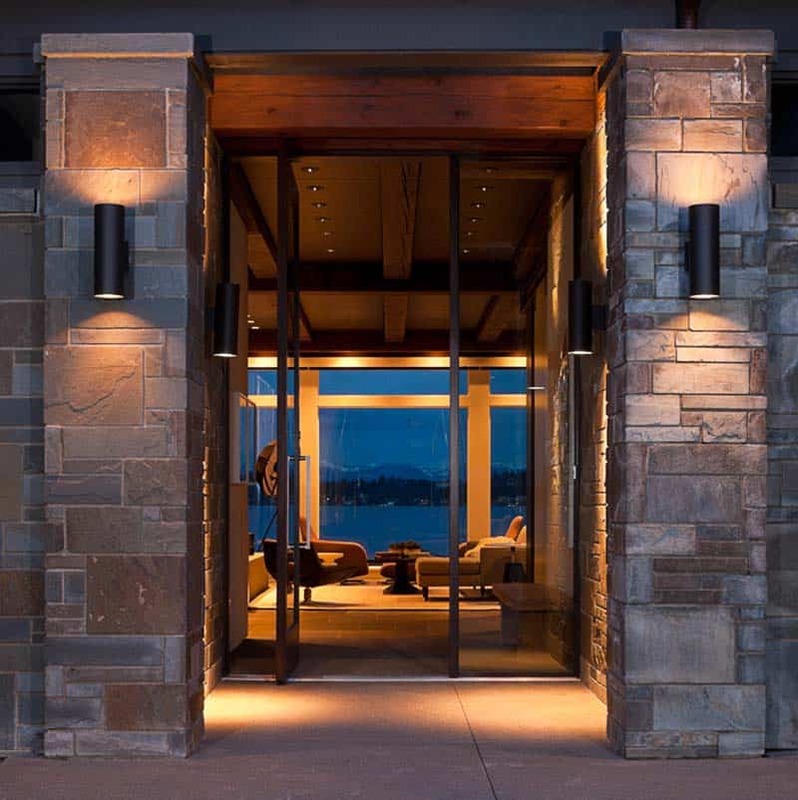 Above: The front entry door is a custom wood pivot door and sidelite manufactured locally in Seattle by Great Northwest Door Company. 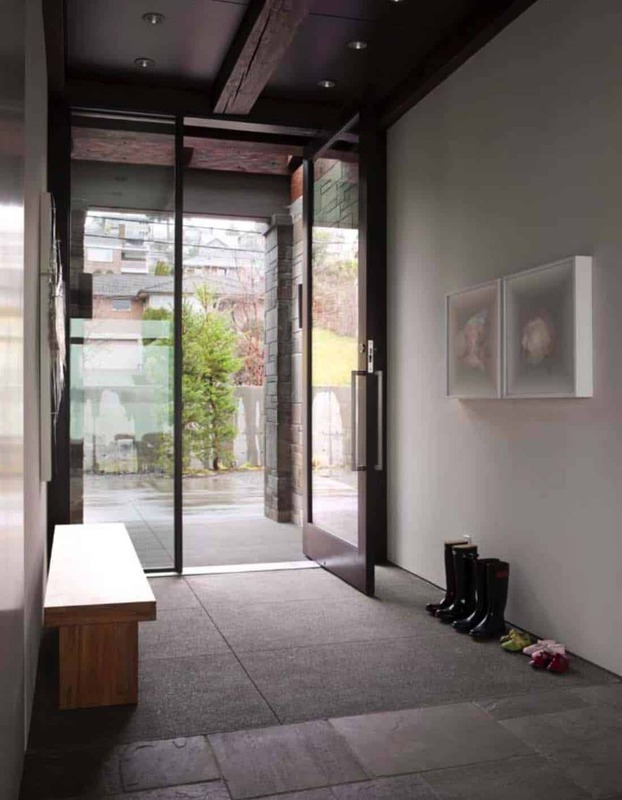 The flooring at the entry is scored concrete that carries the exterior material into the home. The concrete then transitions to large format bluestone. 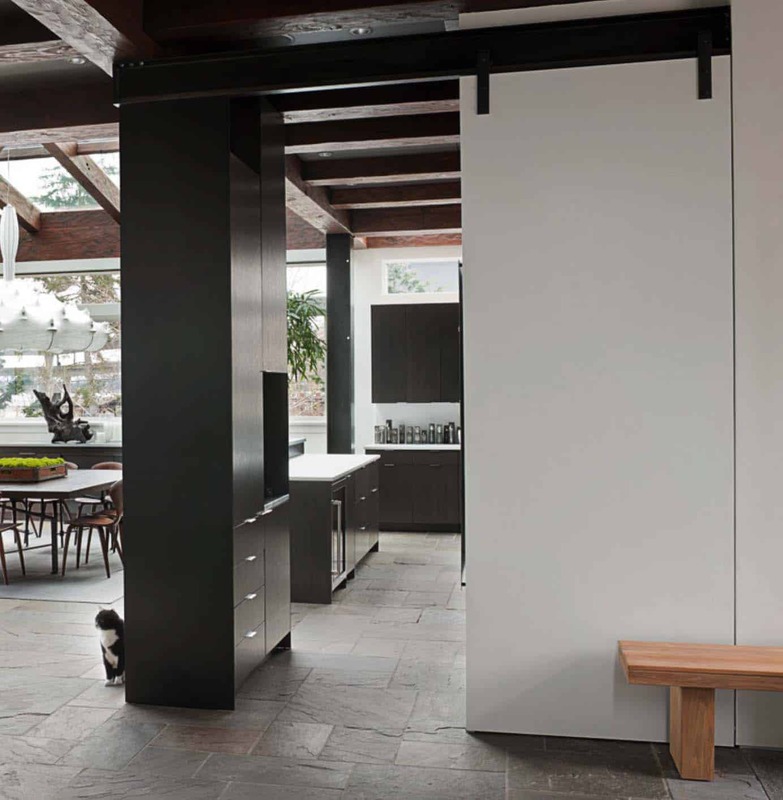 Above: A sliding wall panel is set on a track, composed of a steel channel with an added flat bar welded on. The hanger can be found online if you search for “barn door hardware”. There is a concealed guide at the bottom that helps keep the door in alignment. 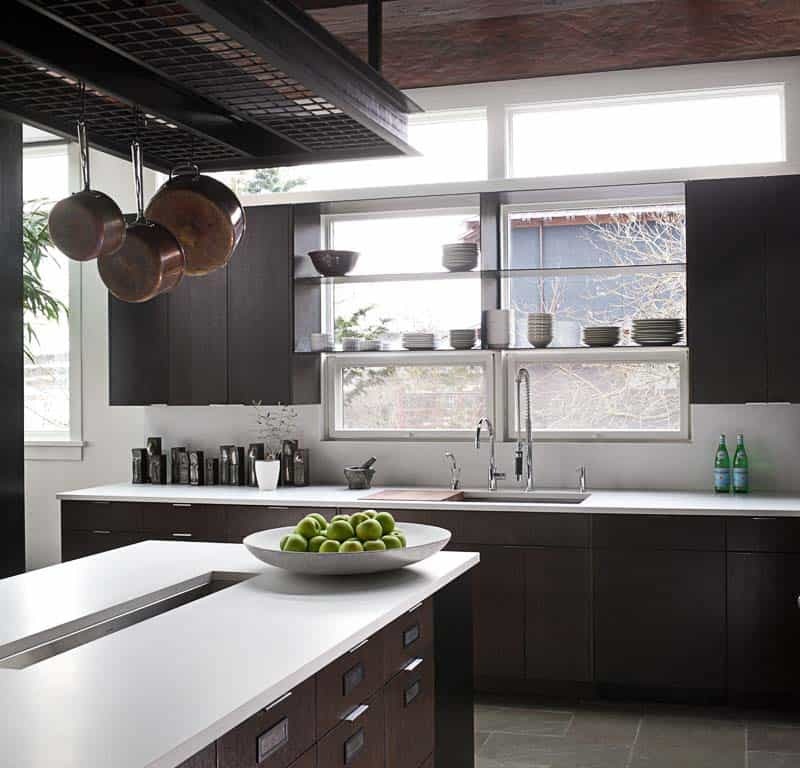 Above: The cabinets are rift white oak with a custom stain. There is a little bit of gray pigment in the mix that softens the ebony. The side panels are blackened steel. The cabinetry pulls are called ‘tab’ pulls from Mockett. 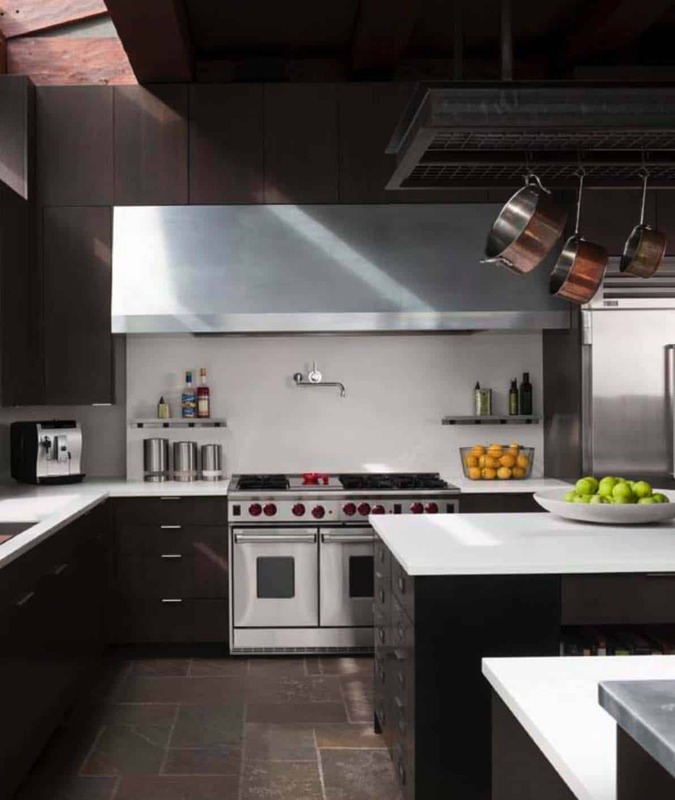 The white countertops (and backsplashes) are a quartz composite product called PentalQuartz. It is the matte version, which softens the bright white. It is highly stain resistant if properly sealed. The bar counter is wrapped in zinc. 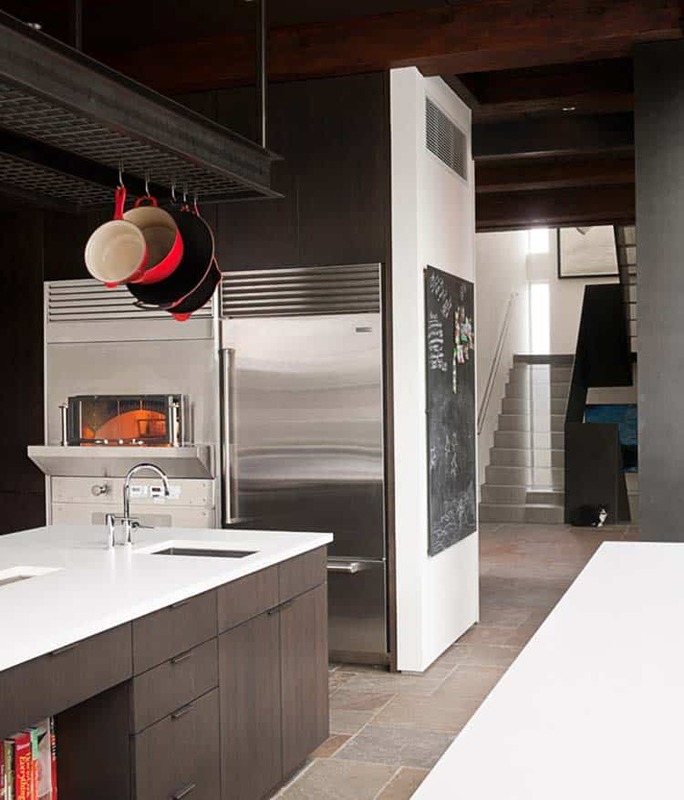 Above: In the kitchen, a custom hood was designed around a Ventahood blower insert. The range is a Wolf. The flooring is bluestone, set in a rectangular pattern. 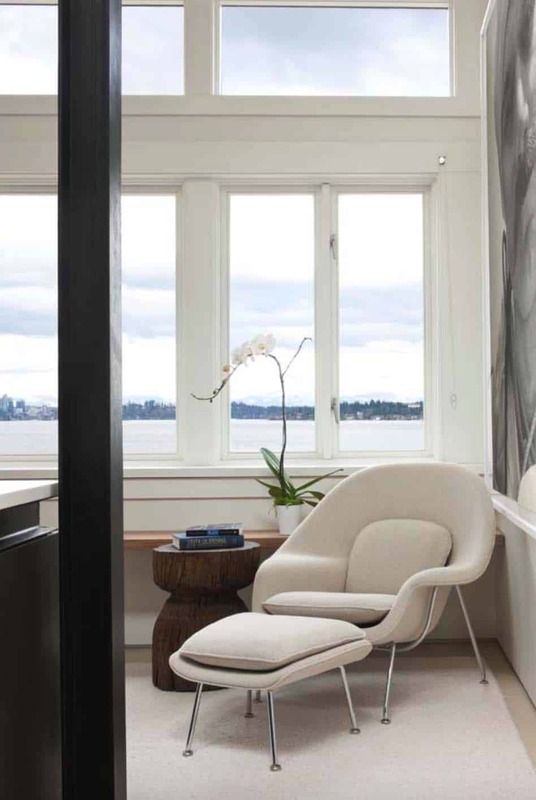 What We Love: This stunning modern home on Lake Washington offers a beautiful transformation with exquisite materials and finishes and stylish furnishings. The overall design offers clean lines and plenty of functionality and durability that are ideal for family living. 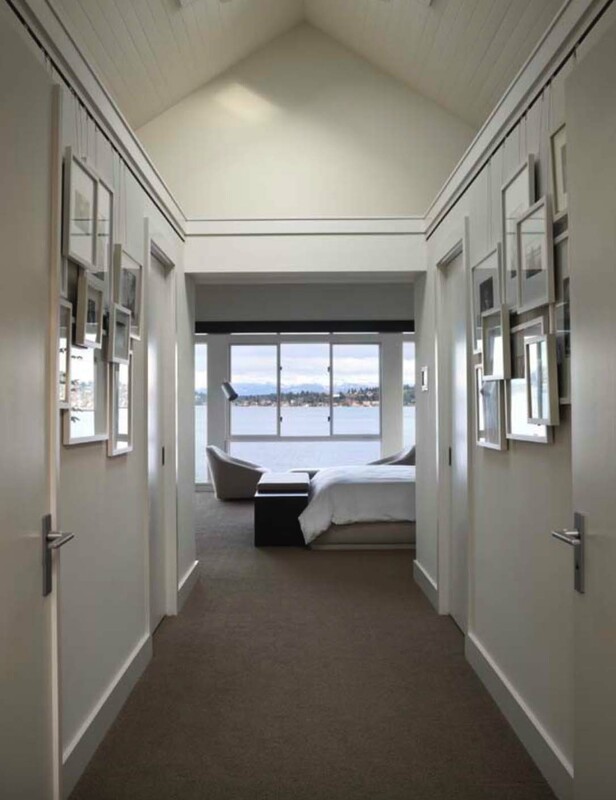 White walls serves as a backdrop to a curated collection of artwork, while large windows frames idyllic views of the lake… Readers, please share with us what you think of the overall design of this light-filled residence in the Comments! 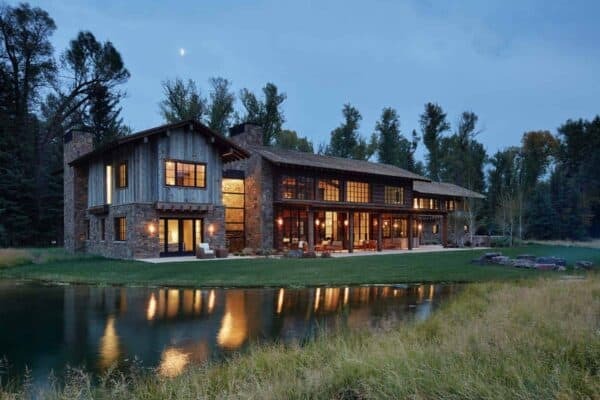 Note: Have a look at a couple of our favorite home tours that we have featured here on One Kindesign from the portfolio of DeForest Architects: Exquisite nature-inspired modern retreat in Oregon’s high desert and Modern rustic retreat designed to feel like a summer camp on Orcas Island. 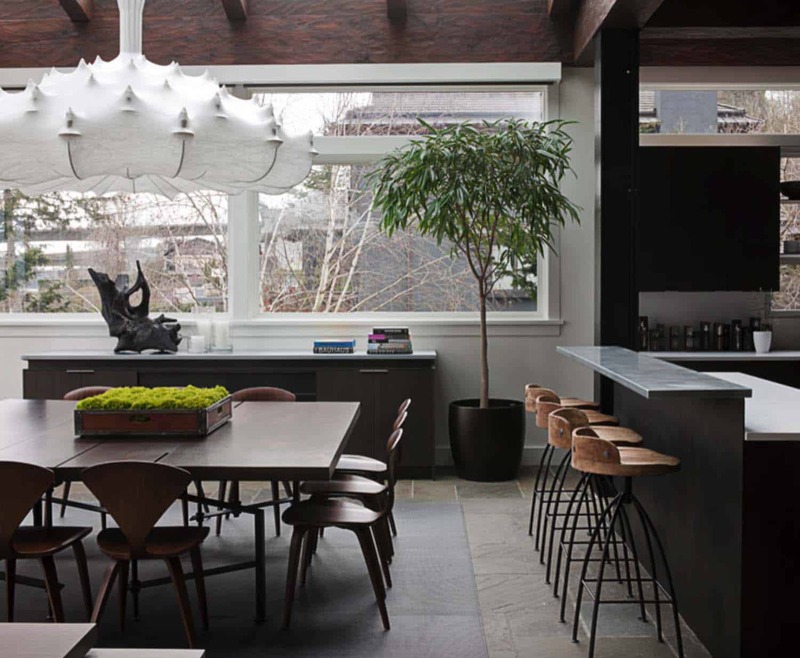 Above: The dining table was commissioned by the interior designers, NB Design Group. 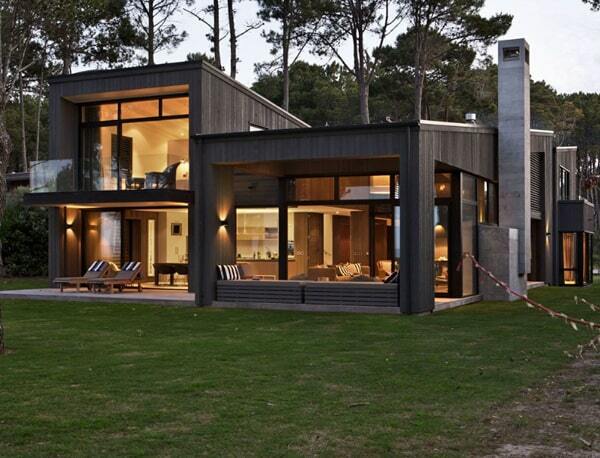 It was designed in two parts so that it can be configured as a long rectangle or the 7′ square shown. 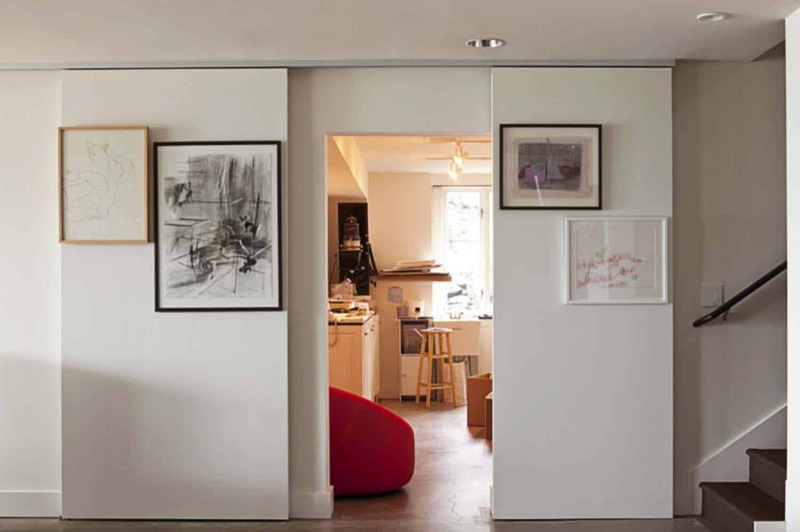 Dining chairs are the Cherner Side Chair – Design Within Reach. The light fixture overhead is a FLOS “Zeppelin” It is a traditional chandelier that is then sprayed with a “cocoon” of resin to create the diffuser. At the bar counter, the wood swivel barstools are by Arteriors, sourced on Horchow. 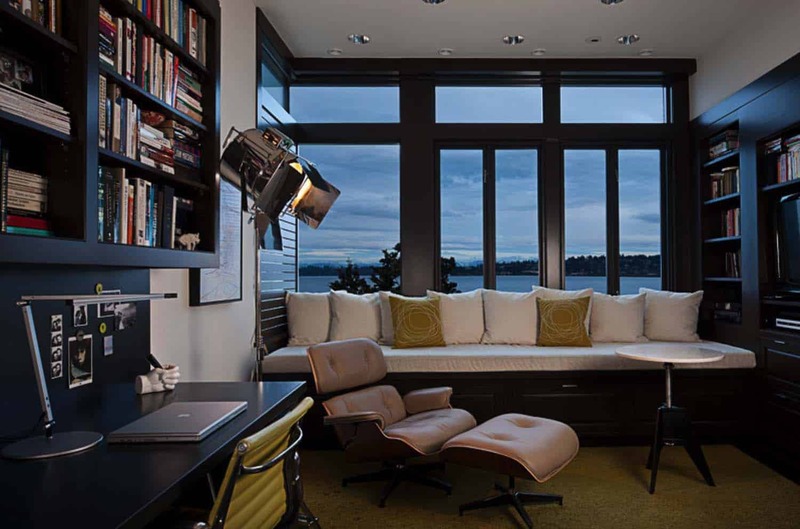 Above: In the home office, a built-in window seat can be used as a daybed for overnight guests. The round table in front of the daybed is the “screw table” by Tom Dixon. The desk was existing. 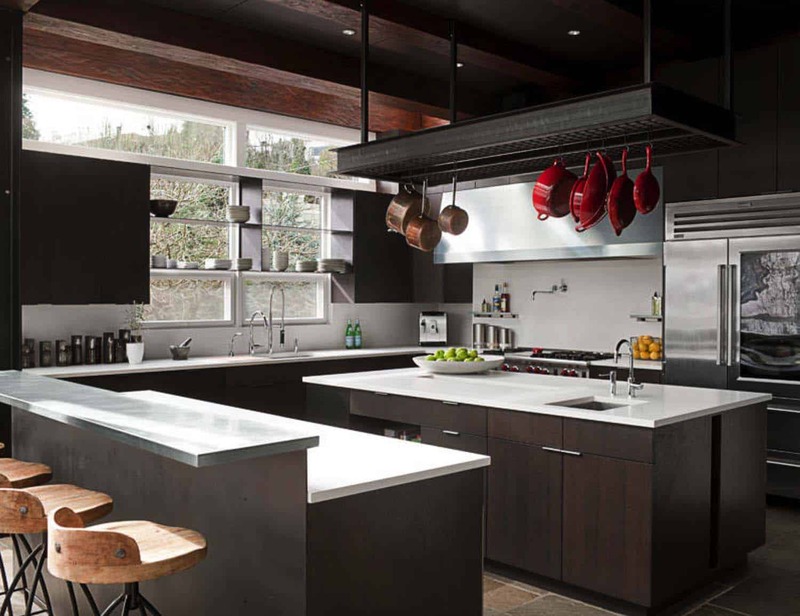 The architects added a blackened steel top and backsplash. Next to the desk is the Studio Floor Lamp Light Fixture by Barbara Cosgrove. 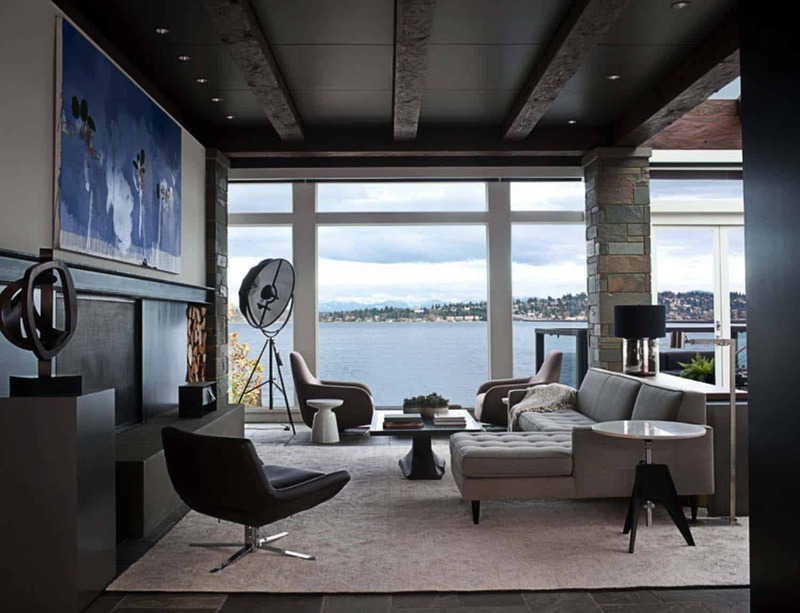 An expansive window frames idyllic views of Lake Washington. Above: The floor tiles in the bathroom are from the “Neutra” series by Casa Dolce Casa, supplied locally by Statements Seattle. The color is ‘silver’ in a matte finish. 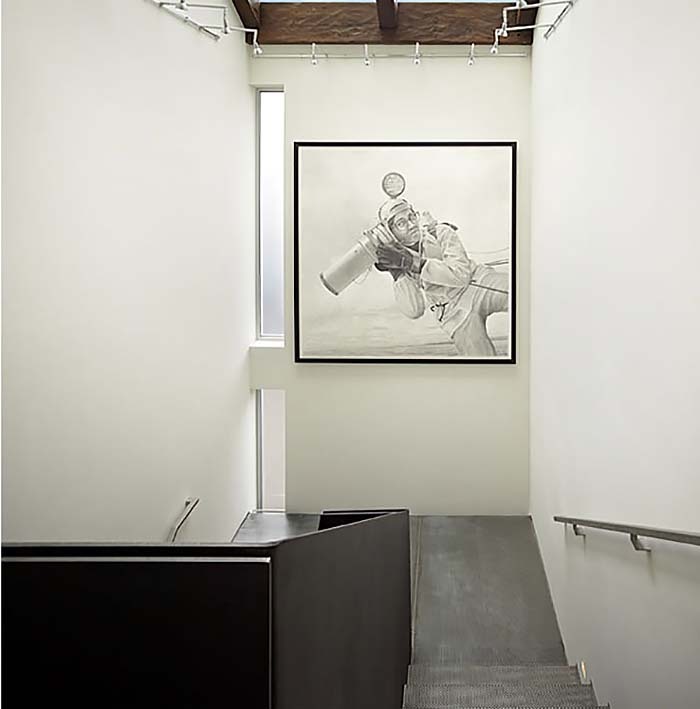 Above: To close off the home office, doors are on a ceiling mounted track system made by Hafele. 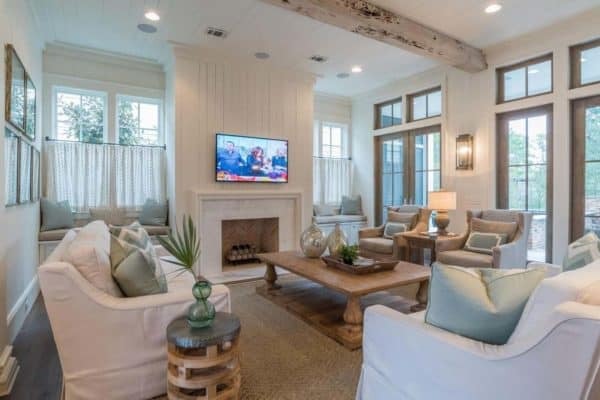 The white wall paint throughout the interiors of this home is White Dove OC-17 | Benjamin Moore (one of the designers favorites). 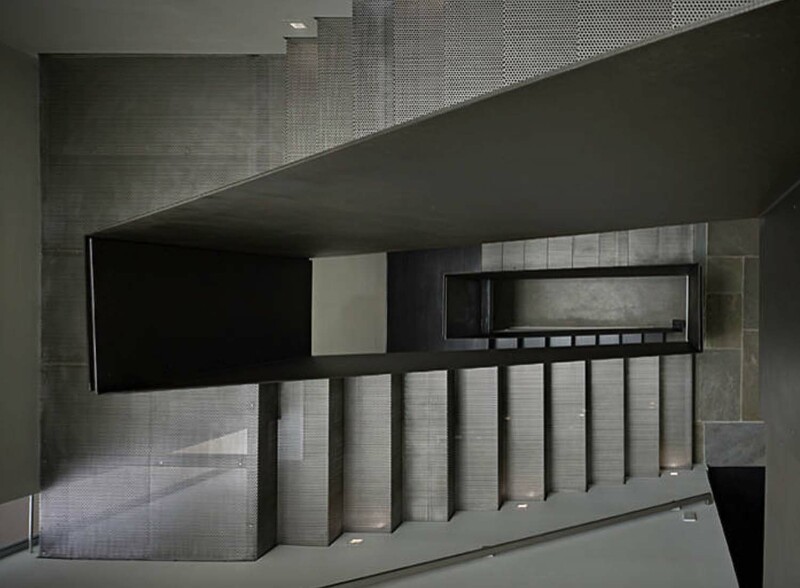 Above: An exercise in minimalism, this stair is a study in light, structure and materiality. This site was a poorly lit existing three-story stairwell. 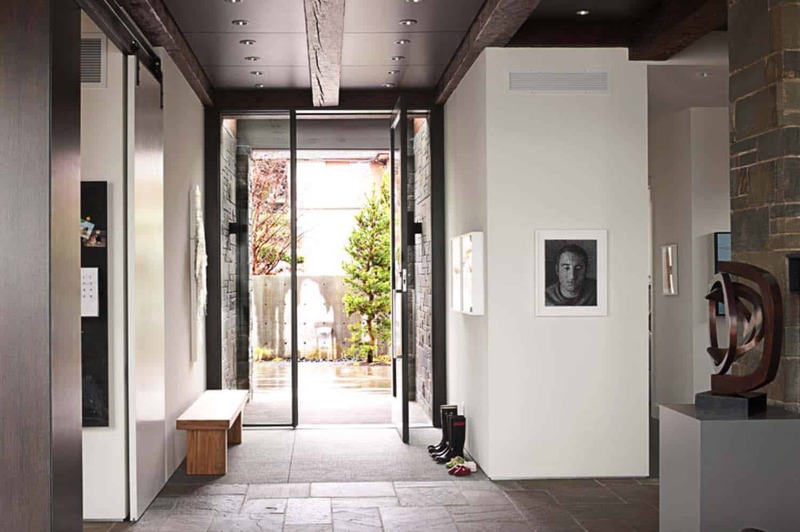 The program was to bring the clients’ art collection to light, to create a vertical gallery that can be enjoyed every day. 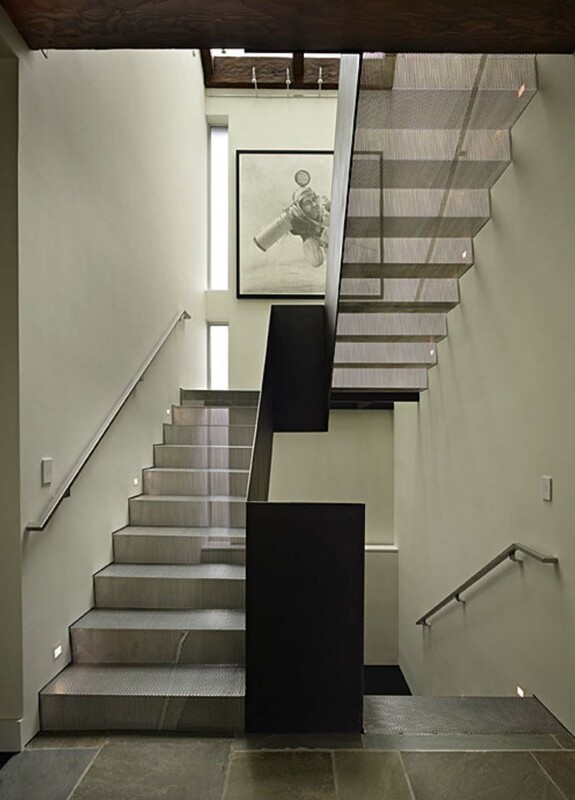 Interesting Fact: The staircase design received a Grand Award from Residential Architect and a Citation from the Washington AIA Honor Awards. 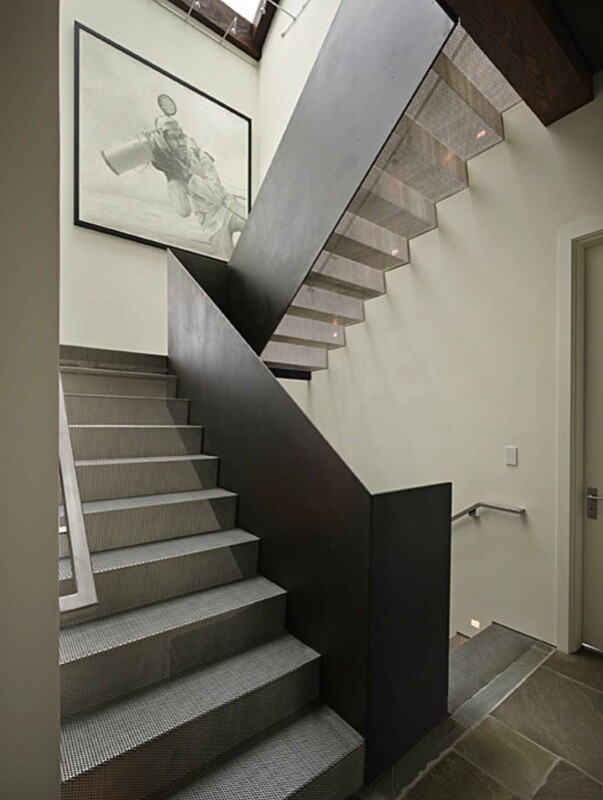 Above: The handrail along the side walls were custom-made by Five Star Metals. 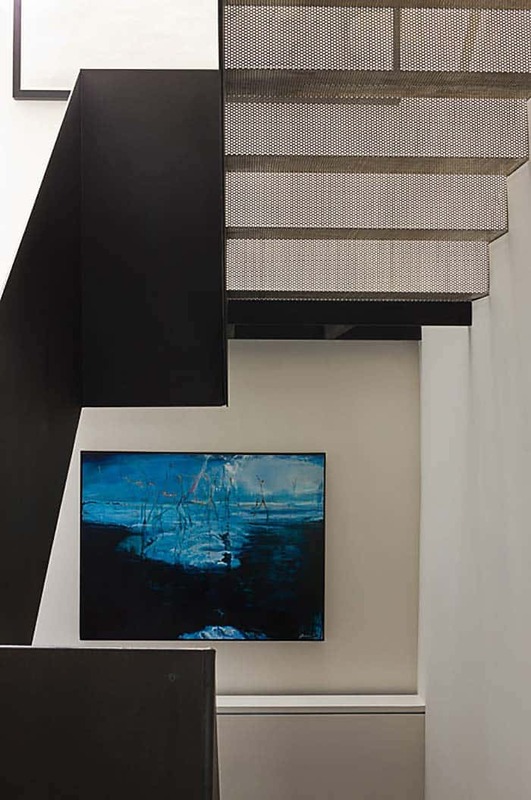 The staircase itself and the steel plate stringer/guardrail was built by a team lead by the general contractor, Roberts Wygal. The steps are composed of a 12 gauge perforated stainless steel. 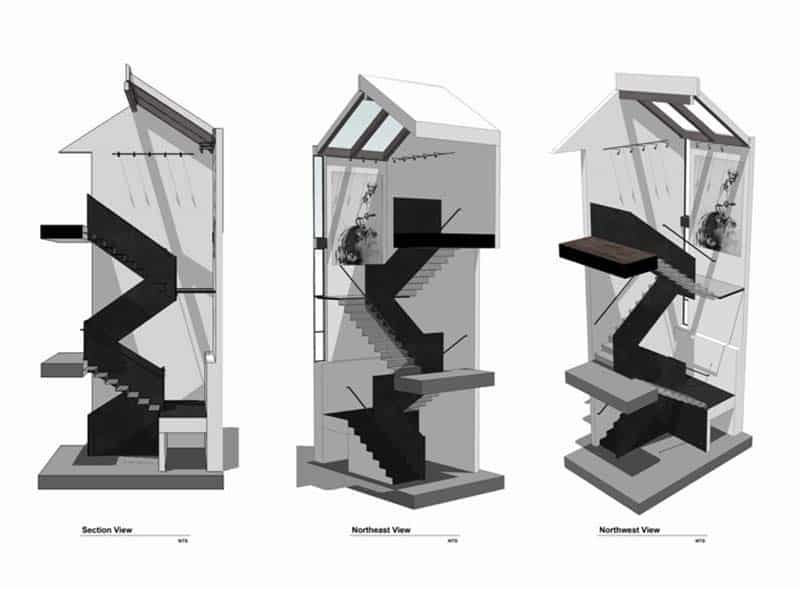 The architect envisioned structurally stable stairs that also had a lightness to them. Above: The carpet needed to be durable for a growing family. 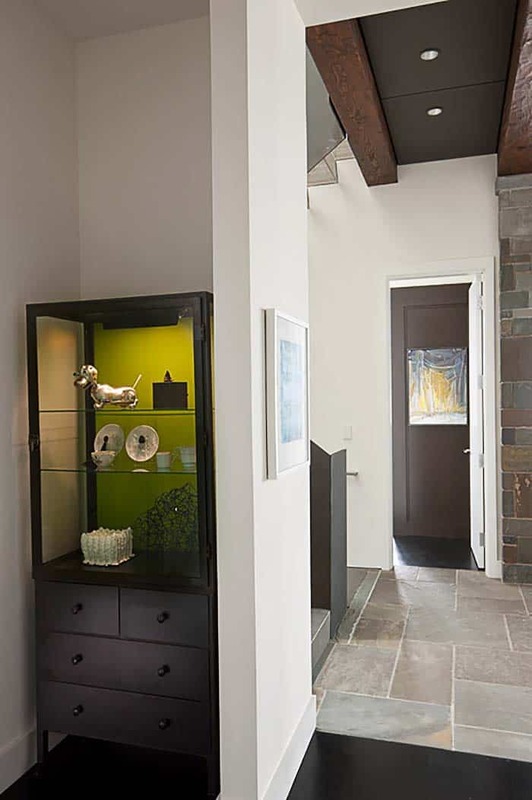 The designers selected Prince Street House & Home, Style: West Village, color: Chanterelle, #408011, 100% nylon. 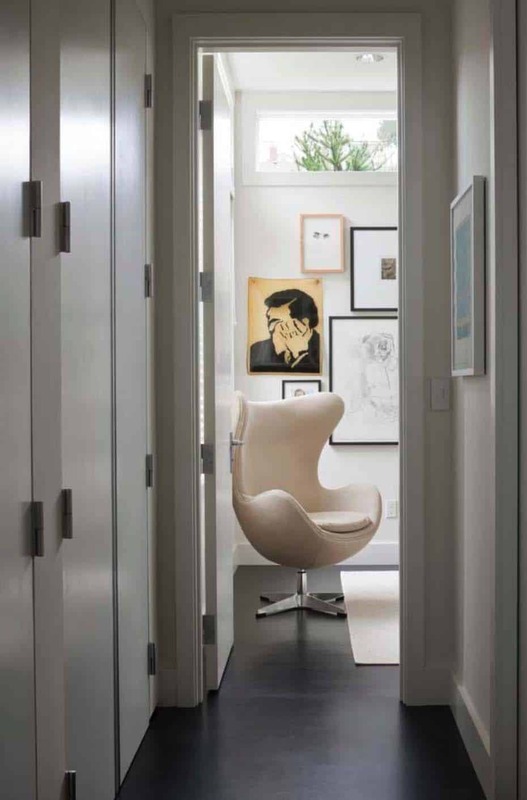 Above: The classic Saarinen Womb Chair and Ottoman can be purchased through your local Knoll dealer. 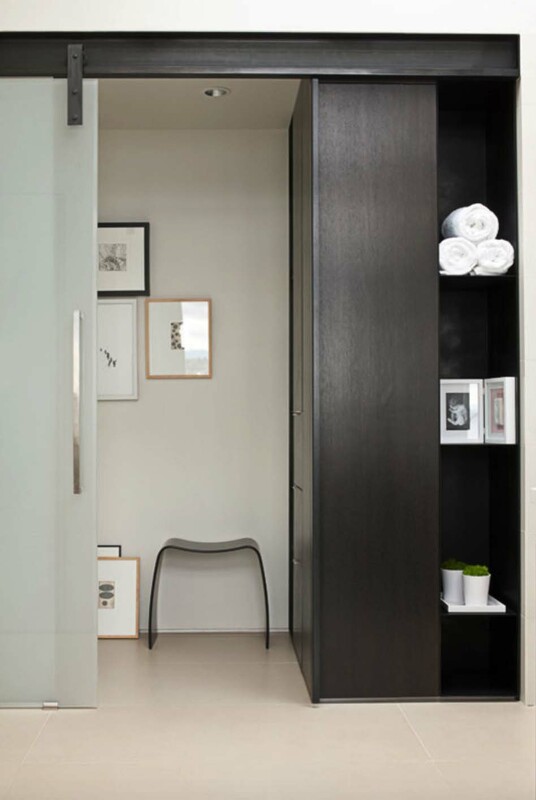 You can also find the chair through Design Within Reach. Above: The countertop is from Pental Granite & Marble and is 3CM. 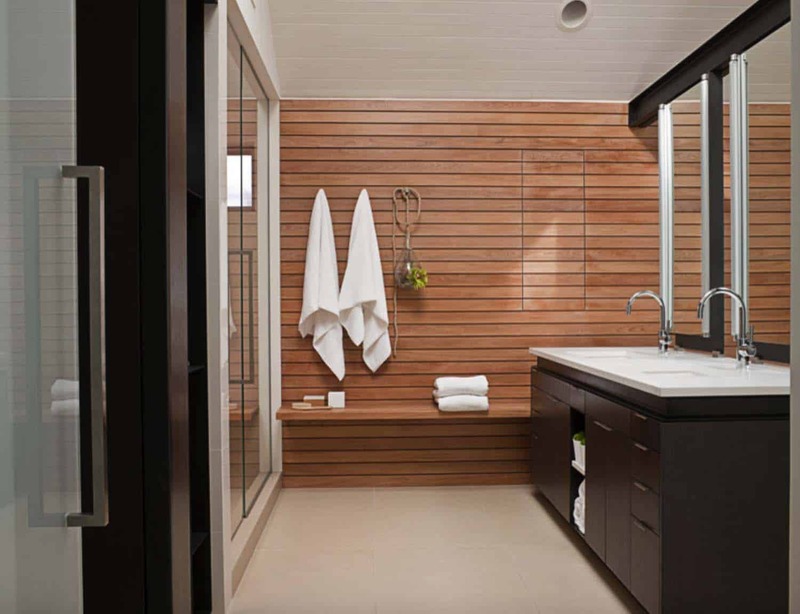 Above: The bathroom wall is teak with a custom stain, giving it a bleached look. The vanity is rift sawn white oak with a custom stain. 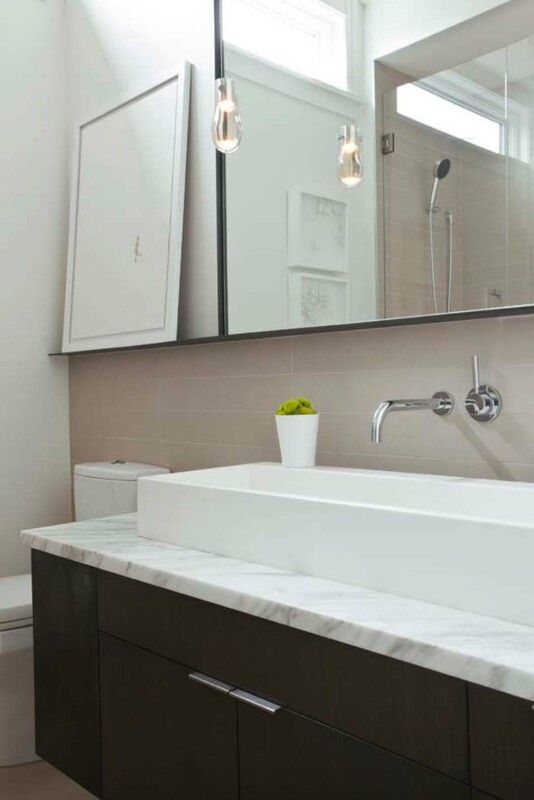 Above: That soaking tub is from Wetstyle, their Cube series. This particular model helps to maximize the bathing area for the given size thanks to the narrow edge. The tub filler is from Dornbracht and is called the Tara Logic tub filler. 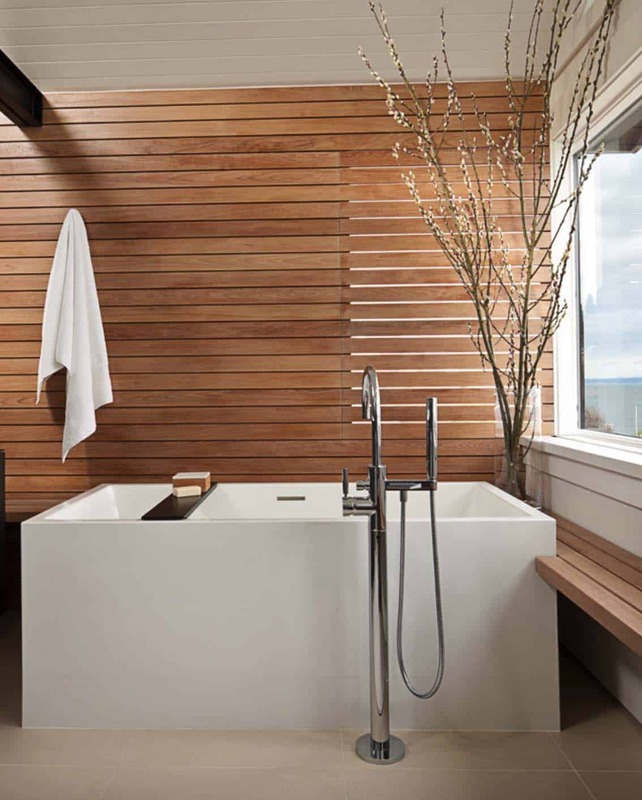 The teak wood slats behind the tub feature a window screen. Magnets hold it in place for easy removal. 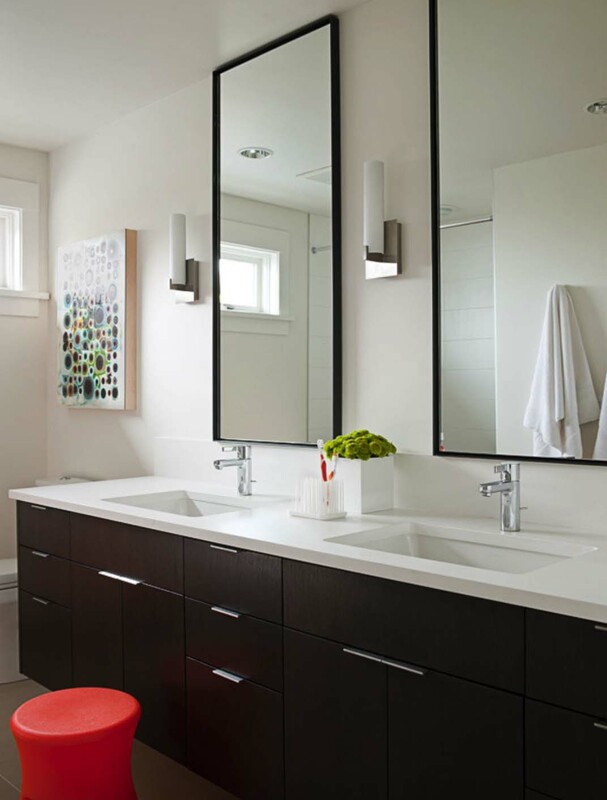 Above: The bathroom sink is the Lacava Aquagrande 39-5/8″W, above-counter porcelain lavatory with an overflow. There’s one word to describe this: bad. The original stone and heavy wood beams must have been great. It’s sad to know that they were buried in this cheap, modern, hotel-like display of really bad art. It’s like every cheap, slick, techno-ish gadgety home design element was thrown under one roof. 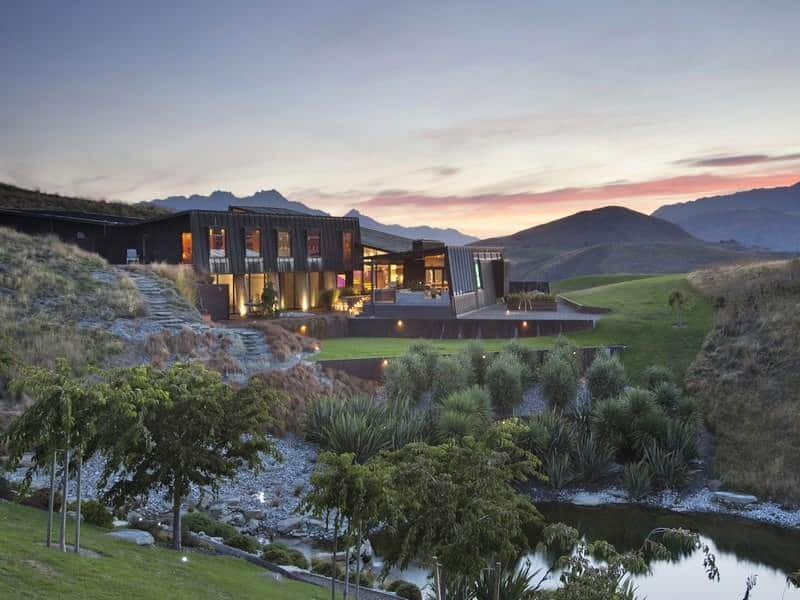 Why did this couple buy this house if they were going to ruin it? The hints of the original materials clash badly with the new, revealing what a terrible mistake this remodel was. Go back to the old.